The televisions in the cafe have been around for about a year now but have not had much use in that time. The only thing they show right now is what day of school it is and what our school’s expectations are. They just replay that over and over and over again. It is extremely boring, but hopefully they will add more content to these TV’s. However, the TV’s have plenty of potential in what they can provide in the school cafe. They could show newscasts of what is going on in the world, or advertisements for the school’s clubs and sports teams. The school announcements could even be shown on the screen for those who either don’t remember or those who couldn’t hear the announcements. In short, there are many great things these TV’s can provide for this school and those in the cafeteria. Many students in the school get their news from the internet and social media. When you receive your news from these resources it can often times be biased, exaggerated, or downright false. Having a news source in the cafe like the TV’s would help to make sure that we students might receive the right truthful information instead of the rumors circled around and distorted across social media. Having this information about current events can also educate the students about political, economical, and social issues as they are instead of reading about it for the first time on somebody’s Facebook rant. And as previously stated, these TV’s can provide advertisements for school sports teams and clubs. In most cases it is hard for school sports and clubs to advertise themselves in the school. The only advertisements these groups receive are from announcements which, students oftentimes don’t hear, and posters which are oftentimes torn down. With TV advertisements, sports teams and school clubs, such as The Crusader Newspaper for instance, could have the ability to advertise to a large portion of the school all year without the threat of their advertisements being torn down or misunderstood over the intercom. 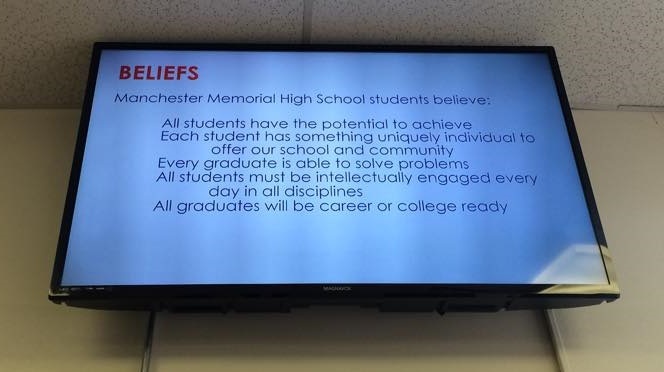 Having TV’s in the cafe showing only the school day and school expectations is a sign of limited potential. You could educate students with fraud free news or you can show the school announcements and events students may have missed. Lastly, they are potential, worry-free advertisements for the school’s clubs and sports teams. These TV’s can be so much better than they are now and hopefully one day we will be using them to their true potential. In a few weeks, we will attempt to provide a live news feed on the televisions in the CAF. Had to work out the details with Comcast which caused a delay. Stay tuned!